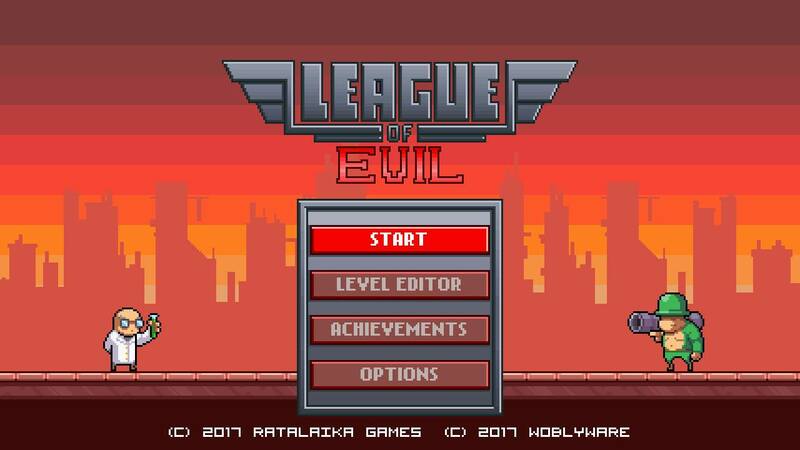 League of Evil is a great little hard platformer in the vein of I Wanna be the Guy and Super Meat Boy. 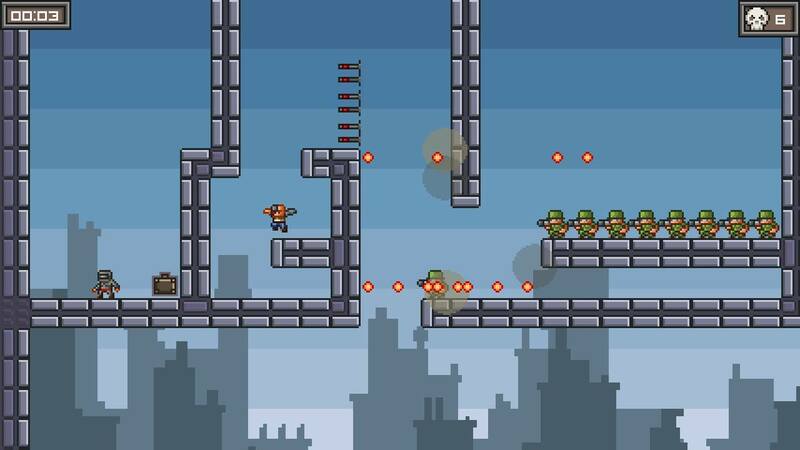 The idea is that you have to masterfully navigate your way through platformer levels with a steady stream of deadly obstacles to avoid. One hit from anything or anyone will kill you, and send you back to the start of the level. Thankfully, League of Evil is designed in such a manner that levels are very short, and so having to start over from the beginning never becomes too frustrating an affair. In addition, the levels are well designed, and the controls are very responsive and allow for a lot of versatility. Because of this, it never feels cheap to die, even if it happens frequently. You know that when you die, it's because YOU mistimed your jump, or YOU forgot to check the enemy's pattern and compensate for it. There will be times when you encounter a new spinning death blade that you don't quite know how to avoid it, but that is just part of the learning process. 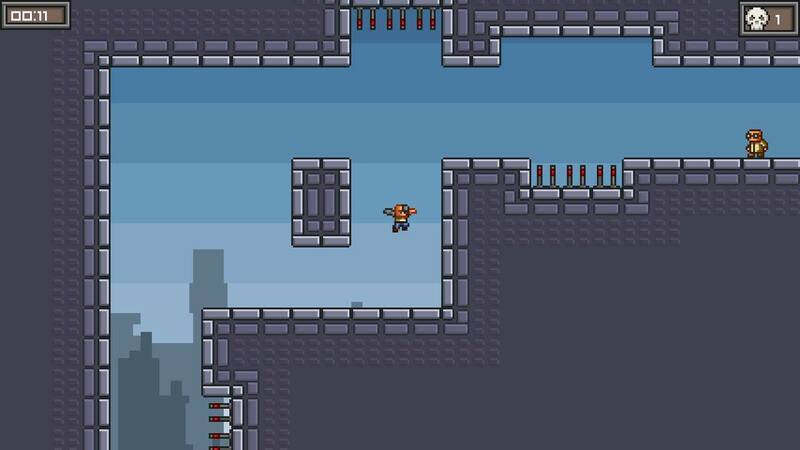 You can jump, and when against a wall or platform, you can do so infinitely. You can press X while jumping for a vertical flip that gives you double jump capabilities, and you have the ability to press Y to rush forward. 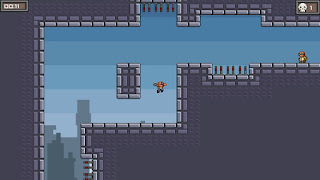 This helps you jump over tall obstacles, and can be used as an attack against enemies, too. B attacks when you're already on the ground. You will need to master all of these little ninja moves to really get through the game. Your objective is to make your way around the levels, avoiding obstacles and enemies so that you can destroy one of the many mad scientists found in each level. These mad scientists' goal is to take over the world, and they've banded together to do so, calling themselves the League of Evil. There are also bonus briefcases to be collected in each level, too. I initially thought that they were necessary to complete the level, but I was mistaken. There are 140 levels to be played, and they build on the difficulty in a natural way that enables us to improve our skills to overcome the more challenging levels. In addition to this, there is additional mayhem to be downloaded in the form of user created levels, one of which I have included here as my last screenshot. You can try your hand at crafting your own missions to share with the world, as well. All of this intense platforming action is carried along with a chiptune soundtrack that had me mesmerized. Sometimes, I would find myself pausing on a platform after taking out a hostile enemy just so that I could sit back and rock out. This cost me high score points for taking longer in the level, but it was totally worth it. 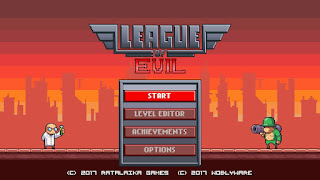 In League of Evil, we've found another great indie action title that packs quite the value punch, ringing up at $7.99. 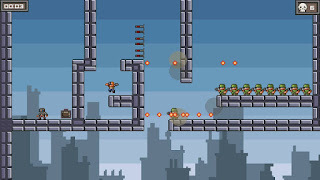 It is a must play for fans of challenging platformers and those that like to torture others with their twisted designs.